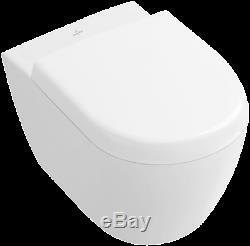 VILLEROY & BOCH SUBWAY WC WALL HUNG RIMLESS TOILET SOFT CLOSIN SEAT CERAMIC PLUS. 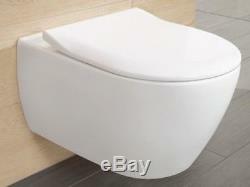 VILLEROY & BOCH WC PAN WALL HUNG SUBWAY 2.0. Rimless with Ceramic Plus Coating. 48cm (Compact) Rimless Pan with Ceramic Plus with soft closing seat - Product Codes: 5606R0R1, 9M69S101. 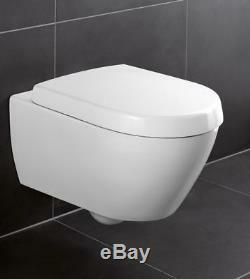 56cm Rimless Pan with Ceramic Plus with soft closing seat - Product Codes: 5614R0R1, 9M68S101. 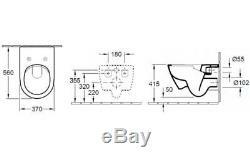 56cm Rimless Pan with Ceramic Plus with soft closing slim seat - Product Codes: 5614R0R1, 9M78S101 (for details and measurements please see the drawings in photo gallery). Beautiful in its minimalism, the Villeroy and Boch Subway range is one of the bestsellers, and it is easy to see why. Innovative continental design breaks away from the predictable, creating a product that is ultra-modern in both looks and functionality. Elegant curves blend seamlessly into the wall, with its wall-hung design instantly making an impression. Concealed fixings cleverly hide the mounting screws, leaving an unspoiled look. 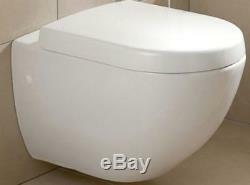 Product information: Collection: Subway 2.0 Finish Colour: White Alpine Installation type: Wall-hung Flushing system: DirectFlush. Coating: Ceramic Plus Outlet type: Horizontal Dimension: Width 355mm (35.5cm) x Height 400mm (40cm) Projection from the wall: 480mm (48cm) or 560mm (56cm). Feedback after receipt of your order would be very much appreciated - THANK YOU. WATCH VIDEO HOW TO INSTALL VILLEROY & BOCH VICONNET WC CONCEALED FRAME. Any product you return must be in the same condition you received it and in the original packaging. 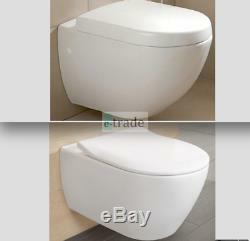 VILLEROY & BOCH WC PAN WALL HUNG SUBWAY 2.0 Rimless with Ceramic Plus Choice of 3 options: Option 1. 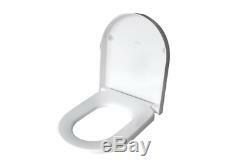 48cm (Compact) Rimless Pan with Ceramic Plus with soft closing seat - Product Codes: 5606R0R1, 9M69S101 Option 2. 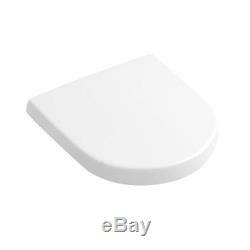 56cm Rimless Pan with Ceramic Plus with soft closing seat - Product Codes: 5614R0R1, 9M68S101 Option 3. 56cm Rimless Pan with Ceramic Plus with soft closing slim seat - Product Codes: 5614R0R1, 9M78S101 (for details and measurements please see the drawings in photo gallery) Beautiful in its minimalism, the Villeroy and Boch Subway range is one of the bestsellers, and it is easy to see why. VILLEROY & BOCH WC PAN WALL HUNG. SUBWAY 2.0 Rimless with Ceramic Plus. 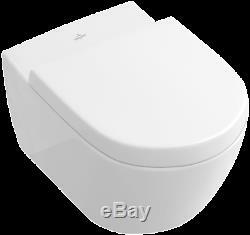 The item "VILLEROY & BOCH SUBWAY WC WALL HUNG RIMLESS TOILET SOFT CLOSIN SEAT CERAMIC PLUS" is in sale since Saturday, June 16, 2018.